Smartphone cameras are getting better and better each year, and they are chipping away big chunks of market share and revenue from entry-level camcorder makers. However, there are still a number of dedicated yet basic, affordable camcorders with features that smartphone owners can only dream about. The Canon Elura 100 is one of the newer entries in the budget camcorder market. In this article, we’ll review this camera and analyze how it compares with other budget-friendly camcorders. What Is the Canon Elura 100? The Canon Elura 100 is a compact, midrange camcorder with a 1.33MP CCD sensor. The 0.8-lb. camera is capable of taking both videos and photos using Canon’s nine-point Ai/AF autofocus system. The Canon Elura 100 weighs about 0.8 lbs. and measures 2.2 x 3 x 4.3 inches. The camera has a four-way joystick for digital effects that is well placed at the back of the camera, near the buttons. There is also a switch for Easy/Program mode. This button gives you quick access to such functions as white balance and the exposure presets. This camcorder has a top-loading tape door which is located on the right of the camera. The door has a zoom rocker and buttons for photo mode, the video light, and printing. The printing function can be used to print if you connect to a printer compatible with the PicBridge application. The device is powered by a CCD sensor. The Canon Elura has decent optical zooming abilities: it can zoom optically up to 20x, and its digital zoom feature can magnify images up to 800x. This camera has USB port, a mini-jack microphone port, and audio and video output ports. Its power button is located at the rear, near the record button on the right. There is also another switch you can use to choose between recording on the SD card and an inserted Mini-DV tape. This camcorder also has buttons for LCD backlighting and recording in wide-screen. The Canon Elura 100’s battery pack is located behind the LCD. Canon says that its battery can take you through 85 minutes of recording. This camera has a 123,000-pixel LCD. With a still image resolution of 1MP, photos taken by this camera are not outstanding at all by today's standards. This camera is sold for about $70. You can get it from Amazon, eBay, Canon’s official store, and other stores. The Canon Elura 100 camcorder costs about $70 on Amazon. The Canon Elura 100 is easier to use than it predecessors in the Elura series. Most buttons on this camera are located on the right and can easily be reached with one hand while shooting. The camera has an easy-to-use, four-way joystick. The menus are generally well organized, although a few commonly used functions like shutter speed and image stabilization are buried too deep for our liking. The Canon Elura 100 has a number of useful features. It 20X optical zoom is handy when taking shots from a distance. The camera has a full suite of exposure presets including Snow, Beach, Fireworks, Portrait, Night and more. It also has digital effects like mirror-imaging, faders, and more. However, its video quality is not impressive. Although the videos are sharp, the noise gain is a bit high and videos are not that detailed because of the low resolution. We have seen better videos taken by some smartphones. The still images taken by this camera have a modest maximum resolution of 1,152x864 dpi. It is clear that Canon endeavored to make this camera easy to use. We like the joystick and the location of most buttons on the right of the camera. The fact that the LCD display rotates gives users some extra flexibility when recording video. This camera comes with a standard 1-one year warranty from Canon. It is designed and built to last a number of years with moderate use. This camera can be bought for about $300 on Amazon. This camera is fairly easy to use. It can be turned on by simply opening the LCD panel. Its touchscreen is not the most responsive one we tested, but it is acceptable to casual users. In addition to standard camcorder features, this camera has a suite of editing features which can be accessed via the touchscreen display. You can give your videos a cinematic look without transferring the footage or file to another device. This camera is also famous for its 0.5x slow-motion recording and up to 1200x fast-motion recording. This camera has an “ancient” elongated tube design, and its battery pack conspicuously sticks out of the back. Its surface design is simple and clean with very few buttons. Unlike the Canon Elura 100, this camcorder has no joystick on the LCD. Like most camcorders from top manufacturers, the Vixia HF R800 comes with a one-year warranty and should be able to withstand casual use for several years. The HDRPJ440 PJ Handycam is the only camera on our list with a built-in projector. The camera enables you to project recorded videos onto a screen. This camera replaced the PJ340 in Sony's legendary Handycam line. It has an Exmor R CMOS sensor and is built around the BIONZ X image processor. In terms of optical zoom, this camera is better than the Canon Elura 100 and can zoom up to 30x while its digital zoom can go up to 350x. The zoom dial and photo buttons are located on the top of the camera. This camcorder has a 2.7-inch LCD display but, unlike other cameras on this list, its display has no touchscreen functionality. The display has a joystick and a preview button. Near the joystick is the projector button that turns on the projector function. The projector of this camera is not impressive: it is rated a paltry 13 lumens with a maximum resolution of 640x360. This camera supports XAVC S format in addition to AVCHD and MP4. The camera has SteadyShot image stabilization, and its 26.8mm wide-angle setting is good for landscapes. The still image camera has face detection abilities (up to eight people), and the sensor can optimize photo quality in low light. This camera’s battery performance is poor in our view, as it is rated at just 1 hour, 10 minutes, by Sony. For connectivity options, this camera has inbuilt NFC and Wi-Fi, so you can use it to live-stream. The camcorder has two HDMI ports, one for the video and the other for the projector. Like the Vixia HF R800, this camera has a hand strap that covers the micro-USB charging port. You get 8GB of internal memory, but you can expand that with an add-on memory card. This camera was discontinued by Sony. We found a used HDRPJ440 on Amazon for about $230 on Amazon, and new models may be available elsewhere. Although this camera's LCD panel has no touchscreen abilities, the camera is not complicated to use. It has a number of buttons, including a dedicated button for the projector. One of the outstanding features of this camera is that it has a projector. It also has a number of useful video and photo features. The camera also has exposure, flash, and white balance presets. This camera has a clean, sleek design. Its LCD can rotate, giving the videographer an option to view the subject from several directions. The LCD has a joystick that is very easy to operate. This camera has a 1-year+90-day warranty. The GoPro Hero4 Black is a powerful, 3.1-oz., action camcorder with a CMOS sensor. The Hero4 camera is the only shockproof and waterproof camera on our list. This camera is waterproof up to 131.2 ft under water. In addition, the Hero4 Black is the only camera on our list that records in 4K, and it can record at a maximum resolution of 3840x2160. The photosensor of this camera is the best on our list, and it can take shots at 12MP. The camera also has an ISI of up to 6400. The Hero4 has a number of white balance presets, including 3000k, 5500k, and 6500K. It has a decent exposure compensation range, a wide-angle lens and a very solid night mode. The camera’s still-photo, continuous shooting feature can function at a maximum of 10 frames per second. The camera has Bluetooth, WiFi, and a USB port. Outputs include an HDMI port and composite video and audio. The camera has a mic with built-in wind and noise reduction abilities. The camera’s rechargeable battery is rated 1.08 hours when recording in 4K, but expect it to last longer when recording in HD. The only major flaw we noticed in the Hero4 is that it is the only camcorder on this list that has no native zooming abilities. 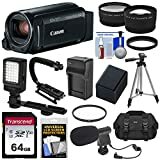 This camera can be bought for about $130 on Amazon. The GoPro Hero is very easy to use with its one-button recording. The camera has a number of control options, including syncing it with a mobile device or using a remote you can strap anywhere. This camera's videos and still shots are of a better quality than any other camera on this list. Its 4K recording abilities cater to the needs of even professional users. Its 12MP still image sensor produces high-quality shots. 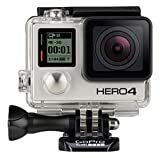 The camera’s shockproof and waterproof features enable it to be used by divers and other action sports enthusiasts. The only notable feature this camera lacks is an optical zoom. This camera has a number of mounts that can enable the user to strap it to the head, wrist, helmet, or elsewhere. This camera has a one-year warranty. However, because the camera was made with the needs of active outdoor use in mind, it is generally more durable than ordinary camcorders. The Canon Elura 100 is sleek camcorder with an optical zoom of 20x. The camera has standard exposure compensation and white balance presets. However, its basic 1.33MP sensor and the lack of Wi-Fi connectivity means that this camcorder is only useful to casual shooters. We give it a rating of 2.5 Stars by today's standards. Users who want better quality videos and still photos can opt for the 4K, 12.0MP GoPro Hero4. This camcorder is lighter, cheaper, and more resilient than all the other camcorders on this list. However, remember that the GoPro Hero4 does not come with native optical zooming abilities. The Full HD Sony Video Recording HDRPJ440 PJ Handycam has decent video recording and photo-shooting abilities. This camera also doubles as a projector but, at a rating of 13 lumens, its use as a projector is limited to very casual, non-demanding home users. The Canon Elura 100 is great performance in low light and rotating touchscreen display, However the 1MP still-image sensor is disappointing. Previous articleAction Cam vs GoPro Comparison: Which is the Better Device?